In the icy bodies around our solar system, radiation emitted from rocky cores could break up water molecules and support hydrogen-eating microbes. 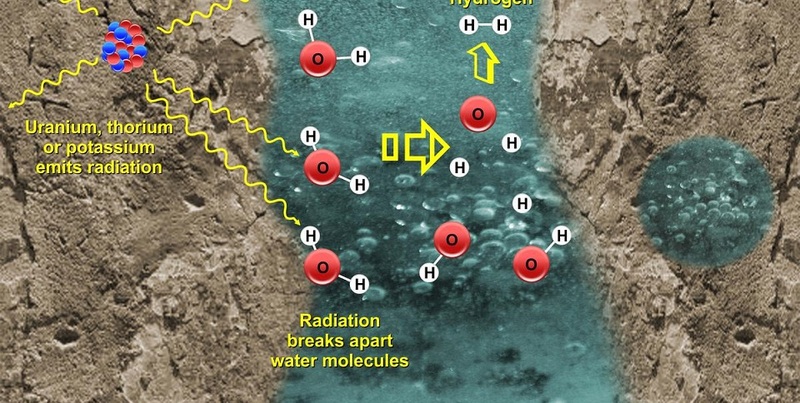 To address this cosmic possibility, a University of Texas at San Antonio (UTSA) and Southwest Research Institute (SwRI) team modeled a natural water-cracking process called radiolysis. They then applied the model to several worlds with known or suspected interior oceans, including Saturn’s moon Enceladus, Jupiter’s moon Europa, Pluto and its moon Charon, as well as the dwarf planet Ceres. “The physical and chemical processes that follow radiolysis release molecular hydrogen (H2), which is a molecule of astrobiological interest,” said Alexis Bouquet, lead author of the study published in the May edition of Astrophysical Journal Letters. Radioactive isotopes of elements such as uranium, potassium, and thorium are found in a class of rocky meteorites known as chondrites. The cores of the worlds studied by Bouquet and his co-authors are thought to have chondrite-like compositions. Ocean water permeating the porous rock of the core could be exposed to ionizing radiation and undergo radiolysis, producing molecular hydrogen and reactive oxygen compounds. Bouquet, a student in the joint doctoral program between UTSA’s Department of Physics and Astronomy and SwRI’s Space Science and Engineering Division, explained that microbial communities sustained by H2 have been found in extreme environments on Earth. These include a groundwater sample found nearly 2 miles deep in a South African gold mine and at hydrothermal vents on the ocean floor. That raises interesting possibilities for the potential existence of analogous microbes at the water-rock interfaces of ocean worlds such as Enceladus or Europa. “We know that these radioactive elements exist within icy bodies, but this is the first systematic look across the solar system to estimate radiolysis. The results suggest that there are many potential targets for exploration out there, and that’s exciting,” says co-author Dr. Danielle Wyrick, a principal scientist in SwRI’s Space Science and Engineering Division. “Radiolysis in an ocean world’s outer core could be fundamental in supporting life. Because mixtures of water and rock are everywhere in the outer solar system, this insight increases the odds of abundant habitable real estate out there,” Bouquet said. Co-authors of the article, “Alternative Energy: Production of H2 by Radiolysis of Water in the Rocky Cores of Icy Bodies,” are SwRI’s Dr. Christopher R. Glein, Wyrick, and Dr. J. Hunter Waite, who also serves as a UTSA adjoint professor.